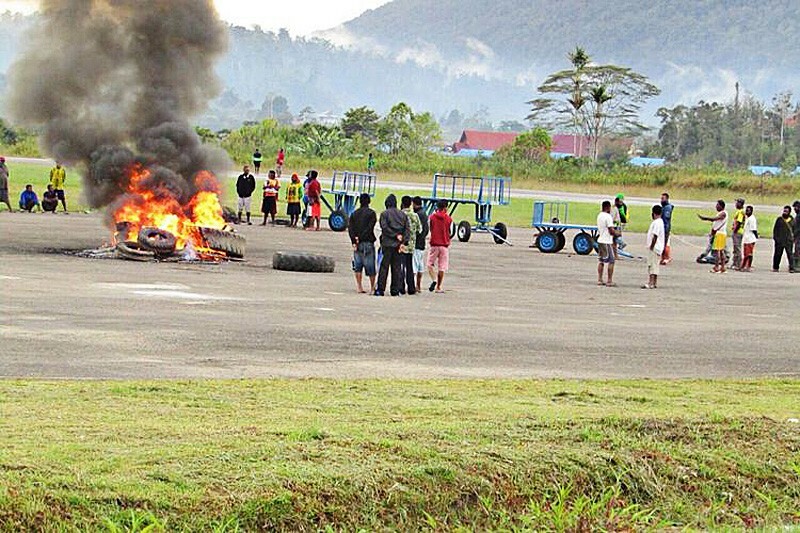 12 April – A group of people set fire to Pegunungan Bintang Regent Costan Oktemka’s residence in Oksibil, Papua, in a riot that erupted on Thursday. The incident was reportedly triggered by disappointment regarding the regent’s failure to fulfill his promises to give door prizes to participants of a fun walk event held to celebrate the 15th anniversary of Pegunungan Bintang regency. The crowd also blockaded Oksibil Airport. Before burning down the regent’s house, they set fire to a stage, tents and chairs prepared for the anniversary celebration. “Some residents became violent and burned down the stage that was going to be used as the venue of the celebration. They later walked to the regent’s house and set it on fire,” said Papua Police spokesperson Sr. Comr. AM Kamal. He said the fun walk event had run smoothly. “They were later disappointed after the organizing committee of the event announced that they would not giveaway door prizes as promised before. Initially, they wanted to file their protest with the regent, but he was no longer at the venue, so they vented their anger on the regent’s house,” said Kamal. Authorities strove to calm them down, but failed because the group had become too big. To avoid conflict, some Oksibil residents sought refuge in houses of worship. “Churches and mosques were full with people and their goods,” said Meryana, an Oksibil resident, to The Jakarta Post. Many people wanted to leave the city, but they could not find access to transportation because Oksibil Airport had also been blockaded. Authorities temporarily closed the airport.